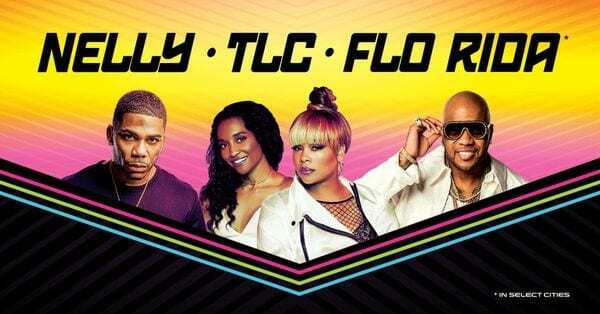 Chart-topping music icons Nelly, TLC, and Flo Rida are teaming up to bring R&B and hip-hop tunes to amphitheaters across North America this summer. The 21-city outing will commence on July 23 at Tuscaloosa Amphitheater in Alabama. From there, they’ll make stops in Raleigh, Toronto, Boston, Chicago, Austin, and El Paso before wrapping-up at FivePoint Amphitheatre in Irvine, California. Each artist has garnered attention over the years for a number of smash-hits that they’ll be sure to deliver across each stage this summer. Nelly, the Grammy award-winning rap superstar, has sold 22.5 million records worldwide. Known for early 2000s hits like Nellyville‘s “Dilemma” and “Hot In Herre,” as well as Country Grammar‘s “Ride Wit Me,” Nelly formed a name for himself as a staple in the hip-hop community. He continued with 5.0 in 2010, followed by the smash-hit “Cruise” with Florida Georgia Line in 2014. His latest record, M.O., was released in 2013. Flo Rida, another iconic hip-hop artist in the industry, has been producing constant hits throughout his career. He first emerged with 2008’s “Low” featuring T-Pain followed by “Right Round (featuring Kesha)” in 2009 and 2012’s “Wild Ones (featuring Sia).” In 2015, he returned with the EP My House, featuring club masterpieces “G.D.F.R.” and “My House,” debuting at No. 14 on the Billboard 200. He is set to release a new LP this year. Want to get in to the top party of the summer? Check out the tour dates below.